Democratic presidential hopeful Bernie Sanders is scheduled to bring his campaign to San Diego for the first time Tuesday. The Vermont senator, whose groundswell of support has kept him in the race for the nomination despite opponent Hillary Clinton’s large lead in pledged delegates, is scheduled to speak at the San Diego Convention Center at 8 p.m. Registration for the free event is full, according to his campaign. His supporters plan to rally and march in downtown San Diego beginning at 10:30 a.m. at the Community Concourse next to City Hall. For the first time in a while, a June California primary is expected to have a major impact on the presidential nominations, so Sanders’ appearance could be the first of many for candidates still in the race, particularly on the Republican side. A handful of Clinton supporters in the Senate, including Barbara Boxer, D-Calif., have called on Sanders to wind down his campaign, noting the former first lady, secretary of state and New York senator has nearly double the number of pledged delegates. “The writing’s on the wall,” Boxer told the website Politico. 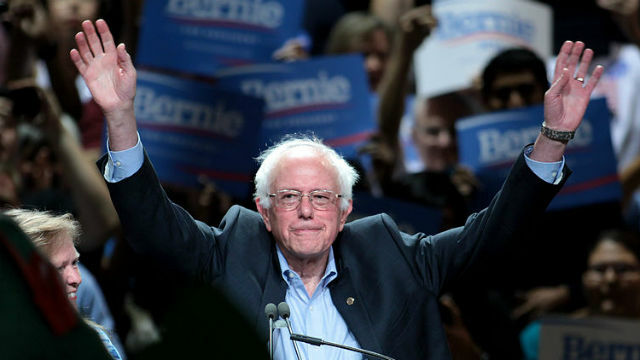 Politico also reported that Sanders raised more funds last month than Clinton — $43.5 million to $30 million, citing filings to the Federal Elections Commission. Clinton had more cash on hand, $31 million to $17 million. Clinton plans to campaign in the Bay Area and Los Angeles. The Sanders campaign asked attendees at the Tuesday events not to bring bags and only carry small personal items like keys and cell phones, for security reasons. Weapons, sharp objects, chairs, and signs or banners on sticks will not be allowed through security. While parking is available for a fee at the convention center, the campaign encouraged carpooling or taking the trolley.